FOREIGN Minister Julie Bishop has confirmed two Australians are among the victims of the London Bridge terror attack. In a statement, Ms Bishop said the government was "deeply saddened" two Australians had been killed. Last night the family of South Australian nurse Kirsty Boden confirmed she the first Australian victim of the attack. Her family said the 28-year-old died after running towards the carnage to help victims who had been mowed down by a van and others who had been stabbed. Sky News is reporting Brisbane woman Sara Zelenak was the second Australian victim of the terror attack. The 21-year-old nanny became separated from her friend on Saturday night as people ran for their lives from a white van ploughing into pedestrians on London Bridge. Ms Zelenak was leaving the bar London Grind, near the bridge, with her friend Pri Gonçalves when they heard the van crash and saw people running from the carnage. Ms Bishop said: "We continue to work with the United Kingdom authorities who have asked we wait for official confirmation of the identities of the victims, and for the families to be officially notified, before we officially release their names." She said the government was keeping in close contact with the families of the victims. Seven people have been confirmed dead, and dozens of others are injured in hospital, following the attack on Sunday morning (Australian time). Before the second death was confirmed, Ms Zelenak's mother Julie Wallace revealed to radio station 97.3FM how her daughter twice before cheated death in terrorist attacks. "The one with the policeman being stabbed about three months ago [at Westminster], she was there the day before in the exact spot," Ms Wallace said. "The one with Ariana Grande's [concert], she was going to go to the concert. Everything she's just missed." Ms Zelenak's friend Ms Gonçalves lost her straight away after the attack and she told Fairfax that the high heels she was wearing may have slowed her down. "I ran thinking she would be running with me but I looked back and she wasn't there," she said. Ms Gonçalves fled through Borough Market and when she saw a terrorist stab a man there, she tried to call Ms Zelenak via web-based messaging service WhatsApp. She attempted to reach her three times, but there was no answer. Ms Zelenak still hasn't checked her Whatsapp since five minutes before the London Bridge terror attack began. "I wish I could have grabbed her hand," Ms Gonçalves told Fairfax, admitting that she felt guilty about having lost her friend. Meanwhile, Ms Zelenak's friends have raised $15,000 via a fundraising page to help with the search and to fly her parents to London. 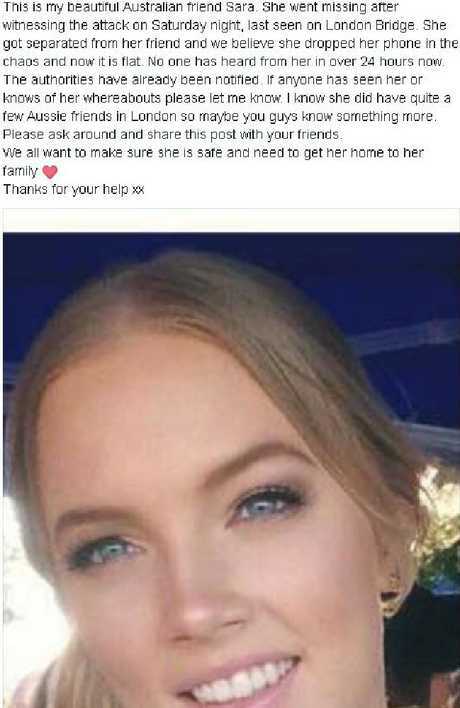 Speaking to media yesterday outside the family's home in Ormiston, east of Brisbane, Ms Zelenak's aunt Tara said she was an "absolutely beautiful" girl. "The family is trying to keep it together but bracing for the worst obviously," she said. "Sara is absolutely beautiful. She is the girl next door, she is a very special kindred spirit. Ms Zelenak's mother Julie Wallace had planned to visit her daughter in France later this month. "We were counting down the days to see her," Ms Wallace told Brisbane radio station 97.3FM. 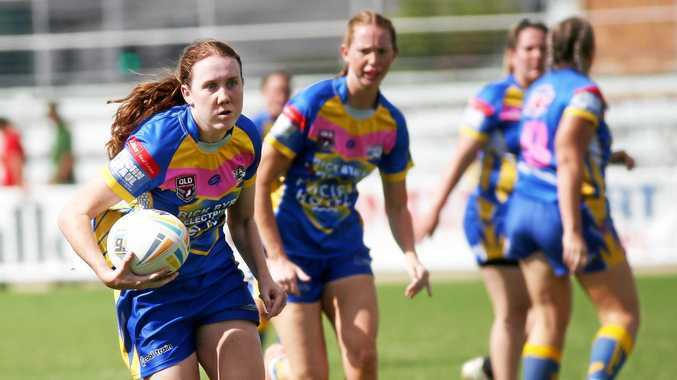 "The last time I spoke to her was our time Friday afternoon at 4.42 and she said, 'Oh mum! It's only 28 days until you and I and dad can have baguettes and cheese and croissants in Paris. I'm so excited to go to Paris!' because she hasn't been. "She's a very smart, sensible girl. She is healthy, fit, trim, taut, terrific - she doesn't do anything wrong in any way. Ms Wallace said she had reacted with "absolute horror" when she was notified that her daughter was missing. "My husband and my boys are insanely distraught. We are a very close family but I have to stay strong for them, because that's what I have to do," she told 97.3FM. Ms Zelenak's mother also revealed that her daughter had narrowly avoided being caught up in both the Manchester and Westminster terror attacks that rocked the UK earlier this year. She had planned to attend the Ariana Grande concert at Manchester Arena on May 22, where 22 were killed, and was also on Westminster Bridge the day before five people were killed when a terrorist mowed down pedestrians in a car.